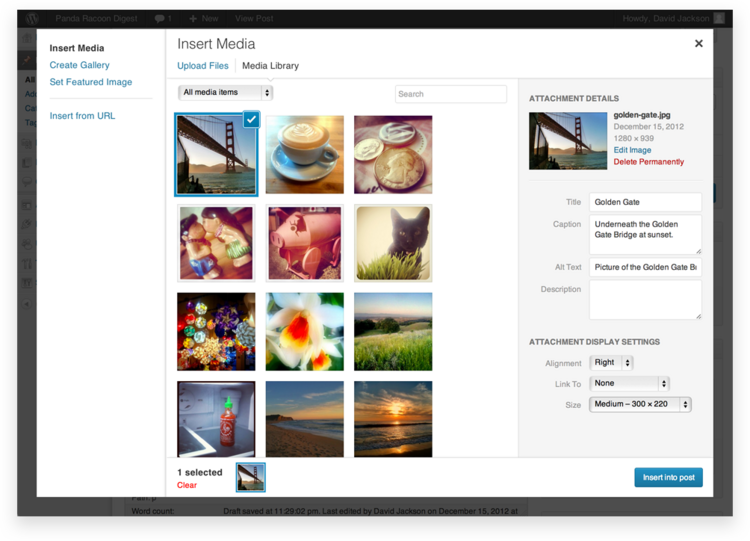 When creating or editing a WordPress page or post, you can easily add images at any time using the WordPress Media Uploader tool. In order to add an image to your page or post, you must first insert your cursor in the place in the text where you want the image to appear. By placing your cursor within your text, you can add images inline with your content.You can also place your cursor on a blank line if you want the image to appear by itself instead. 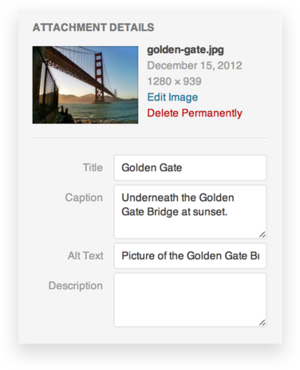 Title: We recommend you enter something meaningful eg Golden Gate and not img2345 that will help you search for the image in the future. Alternate Text: Enter the Alt text for the image, e.g. “The Mona Lisa” to describe the media for accessibility. We recommend this is completed for every image. 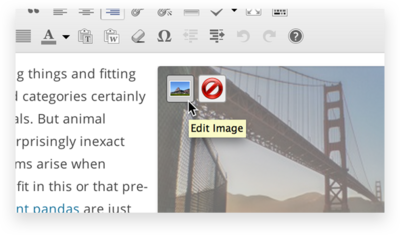 At any time, you can edit the image settings by clicking on the Edit Image button in the upper left hand corner. You can remove the image from your page/post by clicking on theRemove Image button. 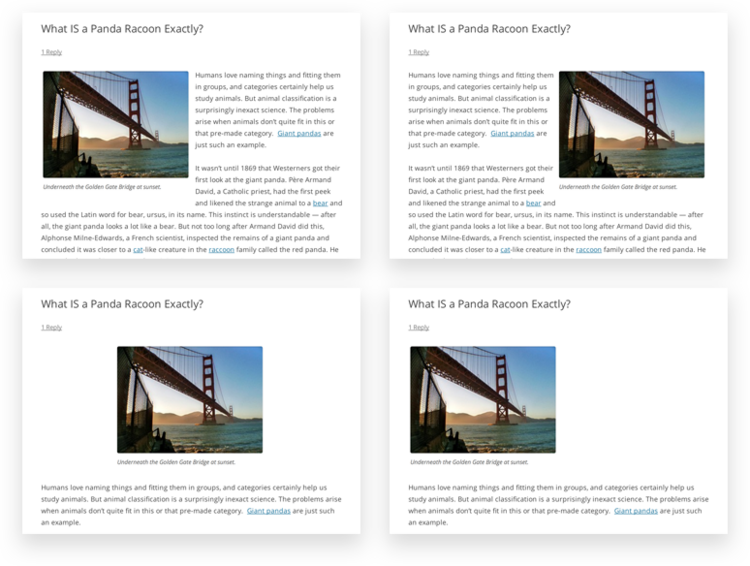 Posts are entries that display in reverse order on your home page and or latest news page. The idea is to add a new post each time you have something to say and not to amend to most recent post. This will build a news history to your site and show visitors that your website is current. Then click the ADD NEW sub-tab. You can say or show the world anything you like on your WordPress web site but here are a few tips you need to know to help you write your posts in WordPress. To be compliant with web standards for accessibility, be sure to include ALT and TITLE descriptions on links and images to help your users, such as <a title="Caroline-Reynolds website link" href="http://www.caroline-reynolds.com">Caroline-Reynolds.com</a>. No one likes to read writing that never pauses for a line break. So, break your writing up into paragraphs, use double spaces between your paragraphs. 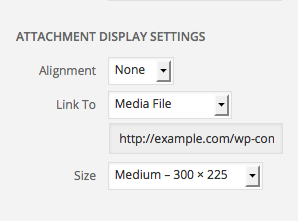 WordPress will automatically detect these and insert <p> HTML paragraph tags into your writing. If you are writing long posts, break up the sections by using headings, small titles to highlight a change of subject. There are spell check Plugins available, but even those can’t check for everything. Some serious writers will write their posts in atext editor with spell check, check all the spelling and proof it thoroughly before copying and pasting into WordPress. Ranting on blogs and social media is commonplace today, but take a moment and think about what you are writing. Remember, once it is out there, it can be seen by many and crawled by search engines; and taking things back is harder once it is public. Take a moment to read what you’ve written before hitting the Publish button. When you are ready, share it with the world! Not all the visitors will be from your part of the world so make sure people can understand easily. Don’t stop posting or amending updating your site. You don’t have to post every day but as a minimum we would suggest once a month. This not only lets you visitors know your site is active but the search engines too. Save your posts before you press the publish button. Anything can happen with your computer or with an internet connection and you don’t need to lose your post. A Domain name is your address on the internet, the www.domainname.com. Domain names are effectively rented and incur an annual cost of €10-15. All our packages include the first years domain name registration, web hosting and support. What will have once I agree to a website package with you? Choose a domain name. If you already we will send the DNS servers details to change on your domain account or you can provide us with temporary login details to your domain account so that we can change the DNS server to point to our web hosting. Provide me with text and images for your website. Confirm receipt of test emails, forms, shopping cart payments, if necessary. The tell everyone you are up and running! You can have all the functionality of a shopping cart which keeps your customers on your website until they are ready to pay, where they are then directed to Paypal to pay either from a Paypal account or with a credit card – customers do not need a Paypal account to buy from your shop. eCommerce integration include with our eCommerce package or can be added as an optional extra to our CMS package. Will my website be compliant with the EU law on cookies? All our packages include full compliance with the EU Cookie Directive by providing a cookies notification for visitors to your site. Web hosting is the place online where your website is saved and accessed by visitors, and all websites need to be hosted professionally. We use Hosting Ireland for all our websites as they provide a very fast and reliable service. Are domain registration and web hosting and fees included? Your choice of website package will include a domain name (e.g. www.example.com) for one year, and one year of web hosting for your new site. If after one year you are happy with the service you have received, we offer an annual ‘service’ package which includes hosting, domain registration fees and continued customer support for your site for just €75 per year. Web hosting is the place online where your website is saved and accessed by visitors, and all websites need to be hosted professionally. We use provide hosting on our Virtual Private Server (VPS) which is very fast and reliable. What can I edit on my website? Once your website has been completed you are free to edit your website at will. You can add more pages, text, images, videos, graphic images and much more. You will simply have full control of the website as you own it 100%. I will create a minimum of email address your hosting and will provide the necessary information required to create an email account on your computer or smartphone. However I do not set up email systems on your computer or smart phone etc. If you do not wish to use your website email address we can create a forward to another address if required. I provide aftercare for all websites I make, usually above and beyond what is agreed. So don’t worry. A domain name is the address that is linked to your new website – for example www.caroline-reynolds.com is the domain name for this website. If you haven’t already got a domain name I will help check for availability of your preferred name. I will explain the advantages of different types of domain names and I will register your domain name on your behalf. Domain name registration is included in the cost of all our website packages. Please note that domain names, although registered on your behalf ar owned by you. Should you terminate hosting services with us your are free to transfer the domain name to another company however this will incur an admission fee of £10. How can I get in touch with Caroline Reynolds .com? Content is all the information on your website. Google likes content to be updated and rewards this with better ranking so it is a good idea to regularly add or amend your content especially on the home page. Words and text contain the most content as seen by Google and other search engines. Pictures have a little bit if correctly used and Flash, the software that makes sites look ‘cool‘ has none unless very carefully done. How can I make payment for my project? We accept 4 payment methods at Caroline-Reynolds.com. Please note that Credit Card payments will incur a 2.4% charge. Do I pay 100% upfront or is the payment split into stages? When the total project cost is less than £100 we do request total payment upfront. But when paying for services from Caroline-Reynolds.com that total more than £100 we will only ever ask for 50% upfront and then 50% upon completion of the project. If it make things easier we can, for our website customers, split the annual maintenance cost to monthly payments of €7.50 for non eCommerce Packages or €15 for eCommerce packages. A signed SSL Certificate importantly demonstrates to visitors that your site can be trusted – sensitive information, such as credit card or bank details, can be exchanged with confidence. An SSL Certificate is a must have for any e-commerce store or website that handle sensitive user data, especially those dealing with credit or debit payments. An SSL Certificate verifies your identity reassuring visitors that their personal data is safe in your hands. An SSL (Secure Sockets Layer) Certificate verifies a websites identity and enables an encrypted and secure connection between your website and your visitor’s web browser. 99.9% of web browsers recognise SSL Certificates, and will display a ‘padlock’ symbol or green ‘https’ in the browser address bar, assuring visitors of the authenticity of your website.